Okanagan Falls, Okanagan Valley, British Columbia, CanadaThis is always a leaner, streamlined gew, welcomed in a region that can easily sun-bloat the grape’s inherent expansiveness. Thanks to their estate 1994 plantings (with German cuttings) and gravel/sandy soils, this remains one of the more interesting expressions in Canada. This was picked numerous times: the first was whole bunch pressed, and the latter picks destemmed, lightly crushed and left on skins for a full day before pressing. All were combined and underwent a long (5 week), cool native ferment in stainless and older French oak. The wine rested three months on lees before bottling. Gooseberry, rambutan, cantaloupe, apricot and fine rasp ginger spice quickly fill the medium-bodied frame, one plumped by lees time. 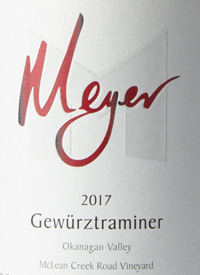 I wish more BC folks treated gew with the attention MFV does.Tasted: 12 September 2018Tasted by: Treve RingPrices: BC	18.00	winery direct, vqa, private retail Producer: Meyer Family VineyardsDistributors: International Cellars Inc.